Babies learn to walk at different speeds and accomplish it at different ages. 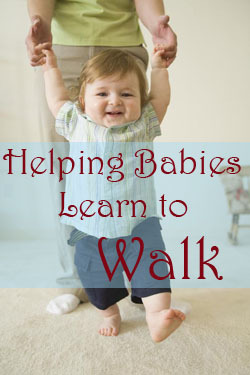 Walking is not only an important developmental milestone, but also a convenience, so many parents are eager to know when their babies can learn to walk and how they (the parents) can help teach them. Our youngest son was a late walker, to the point where we sought advice from our pediatrician and from physical therapists. Their guidance and our own experience from teaching three little walkers (all of whom are runners, now) are the basis for this article. When Can A Baby Walk? Age and developmental stage. When I say that most babies take their first steps at 9-12 months, that’s adjusted age. As many twins are born as preeemies, they can take a bit longer. Coordination and physical strength are both required, and generally obtained with practice crawling and pulling up on things. Environment. The household, the day-to-day activities, and the presence of siblings can all influence how soon babies learn to walk. Genetics and personality. The latter was an important factor for our youngest; he’s a happier child and was simply content to stay where he was. He finally began to learn when his older brother was walking and out-raced him to every desirable toy. Between our pediatrician and some physical therapists, we used several exercises to help our littlest boy get his feet on the ground. First it was just a matter of teaching him to pull up on the edge of tables, couches, chairs, or other steady objects. This builds both leg strength and confidence. Eventually they learn to start cruising along these things while holding on. Don’t forget to make sure your home is babyproof. Sometimes I’ll hold both of his arms and encourage him to walk, but that doesn’t always work. He’s just not always into it. 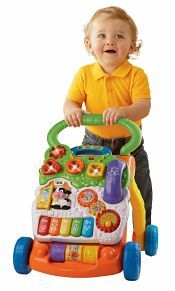 When he’s holding onto a wheeled cart or the Vtech baby walker, however, he just loves it. He’ll walk around as long as we’re willing to keep turning the walker around, until his little legs poop out. We set up a narrow lane for him to walk through (like between the couch and the coffee table), so that he can only move sideways. It’s good practice, but getting him to go along with this scheme isn’t always easy. It works best if we put some of his favorite blocks or snack at the far end to lure him along. This, in my opinion, is the critical exercise that teaches a toddler to walk. The parents sit or crouch a couple of steps apart, and take turns encouraging him to walk to each other. As he gains confidence, you move a couple steps back. But it’s important never to back away while he’s walking to you. If he expects you to catch him in two steps, don’t let him down. Once our older twin mastered walking independently, he still needed lots of practice. We encouraged it by giving him a Fisher Price Corn Popper. It’s colorful and noisy; he loves pushing it along but doesn’t get any support from it. Not the greatest thing for when anyone’s trying to sleep in the house, but it sure keeps him entertained. It was a few months ago that our youngest got the hang of walking. A couple of times while we were teaching him to walk, we asked ourselves, “Are we sure we want to do this?” After all, he was going to learn eventually and it’s far, far easier to contain and entertain twins before they can walk. Now, he and his siblings don’t usually walk anywhere. They run, race, climb, or ride little toys. 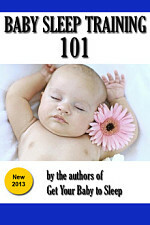 So unless your baby’s development is way behind the curve, don’t rush this! Every milestone achieved is one less to look forward to, and walking is a big one. At the very least, make sure you have the video camera ready! I wish I would have had this post to read a month ago! My little toddler is learning to walk, and I was looking on the internet for ways to help her. You also made me laugh because you are totally right – walking is overrated! lol. Now that she is getting the hang of it, I am beginning to wonder what I was in the hurry for! Right! And a whole new era of babyproofing begins as they start walking, running, and reaching up onto tables/countesr for things! Oh man. What am I going to do when my daughter can start opening doors and stuff?! I’m never going to sleep again! I love your commitment, and man oh man, what a job with twins! I must say, and you and I can agree to disagree on this, there’s no reason to “teach” a child to walk. 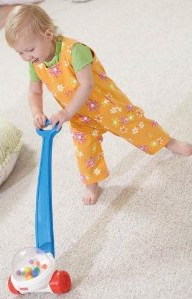 Babies that are given plenty of floor time without being confined to Exercausers and Bumbos and the like, learn to walk on their own timeline. Scheming babies is a manifestation of our own anxieties that there may be something wrong with them, which in most cases, there is not. Holding their arms above their head is unnatural and lends for misaligned walkers who reach up instead of out when they are about to fall. Not ever a good idea. I say, give barefoot babies plenty of floor time in safe spaces (hooray for baby gates!) and let them unfold with patience and trust in their innate abilities. I have twin girls. They turned one on Dec 24th. The 2nd twin she started walking at a 1 year and 1 month. The 1st twin still doesn’t stand on her own. She will hold on to the couch and anything else and walk. I’ll get her and walk with her and I’ll let go and she will just sit down. Is this normal l. I’m kind of getting considered.